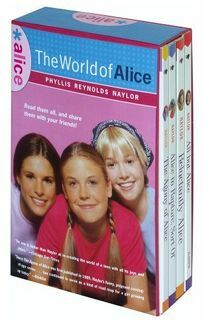 First published in the 1980s and early '90s, and reissued with photographic covers in 2001, a quartet of the Alice books by Phyllis Reynolds Naylor are now available in a boxed set of paperbacks, The World of Alice. In The Agony of Alice, Alice is looking for a role model, but her family is no help. Who's going to show her how to be a teenager? Alice has her first boyfriend in Alice in Rapture, Sort Of, but she finds that a boyfriend can be much more complicated than a friend. The heroine can think of seven things about seventh grade that stink, in Reluctantly Alice-but there's a lot to like about junior high, too. In All but Alice, Alice just wants to fit in, but soon discovers that she doesn't like everything the ""in"" crowd does.